The Kit is a manual produced by the United Nations Association in Canada with the support of Canadian Heritage Multiculturalism. 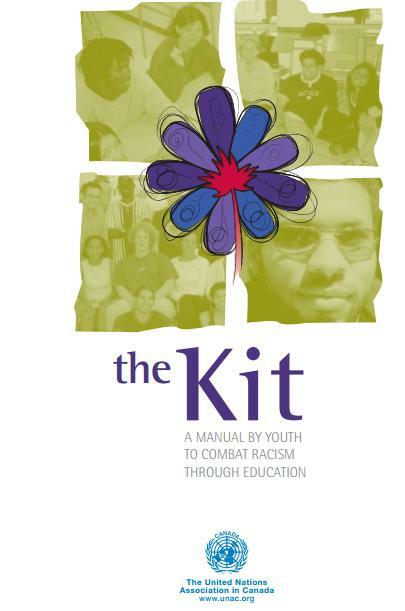 The Kit is an anti-racism apparatus created by youth for youth. It was a result of a project by United Nations Association in Canada called Youth Forums Against Racism. The manual consists of various recommendations from the forums in order to create a youth focused anti-racism education model. The Kit consists of three sections; information, tools, and resources. The information section looks at current issues, tools includes range of workshops and ways of organizing anti-racism activates, and resource section lists a range of books, educational materials and videos to further gain knowledge of racism. The Kit has background information on anti-racism as well as action/project guide to get youth involved in anti-racism organizations and education workshops to create awareness. To access The Kit click http://www.unac.org/yfar/the_kit.pdf.